DIXMONT — The Dixmont Conservation Commission is hosting a presentation on “Maine’s Wild Brook Trout: The Past, Present and Future of a Heritage Fish” at 6:30 p.m. Wednesday, April 18, at the Gold Crest Riders Snowmobile Club. 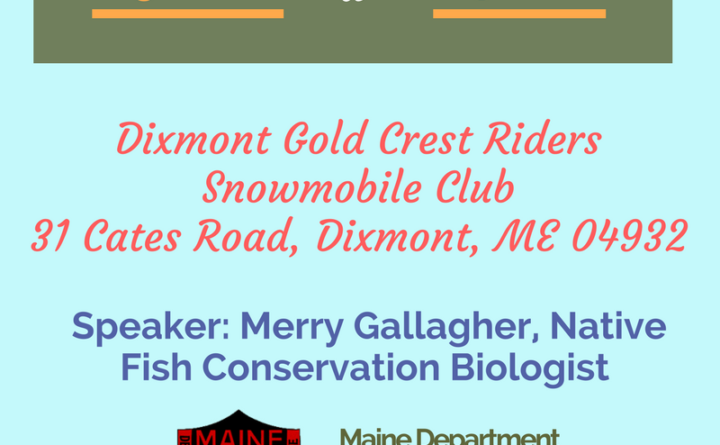 Guest speaker will be Merry Gallagher, Fisheries Biologist with the Maine Dept. of Inland Fisheries & Wildlife. Even if you’re not a fishing enthusiast, come learn about one of Maine’s most iconic and treasured wildlife species. Merry will talk about the life history, conservation and management of brook trout, and what we can do to enhance habitat on a state and local scale.